DANCKERTS -Sterre Kaert of Hemels Pleyn, Waer Door Men Kan Wete Hoe Laet . . .
DANCKERTS, C. - Sterre Kaert of Hemels Pleyn, Waer Door Men Kan Wete Hoe Laet . . .
Sterre Kaert of Hemels Pleyn, Waer Door Men Kan Wete Hoe Laet . . . - DANCKERTS, C.
Title : Sterre Kaert of Hemels Pleyn, Waer Door Men Kan Wete Hoe Laet . . ..
Map maker : DANCKERTS, C.. Size : 18.5 x 22.8 inches. / 47.0 x 58.0 cm. 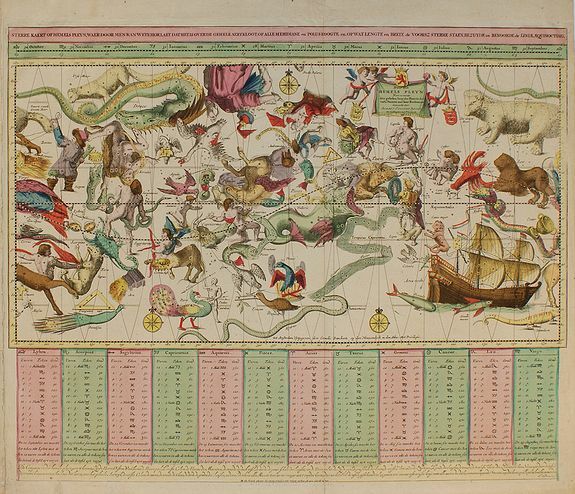 Description :Mercator style projection of the entire night sky showing all the heavenly bodies and with panels of astrological notations below. Prepared by Remmet Teunisse Backeret et engraved by J. de Broen, it was originally published c.1684 by Johannes van Keulen. It was subsequent republished until last edition by Elwe in 1792. The 1713 issue by Danckerts is uncommun. Koeman, El 2 # 2, Carole Stott, Celestial Charts, p. 88-89. Condition : A whormhole lower part. Otherwise in very good condition.